Gift cards are a popular choice for those "hard to buy for" people we all have in our lives. It's nice to dress it up and make it just a bit more personal though and these "pop up" gift card holders are one of my favourite ways to do it. Using the Thomas Kinkade papers means you get a really dressy result without spending a lot of time on it - perfect for the busy Christmas season! I first saw this little gift card holder as part of a Splitcoaststampers challenge which pointed to the video instructions on the Hero Arts blog. I warmed up the base with a fine houndstooth pattern (I find it easier to do this before sticking anything together) and then cut a section of one of the Kinkade quad papers with a Nestie to make a panel for the front. I wanted a narrow mat so I ran a blade around the outside of the same Nestie I used to die cut the image. A gold gel pen adds a little definition between the two and a gold embossed stamped sentiment finishes it off. I punched a slot with a Making Memories slit punch to thread my ribbon through under the image panel. Inside the holder, I used one of the background papers from the paper pack to make a nice finish. Just cut strips of 4" x 6" and stick them in place. I stitched a punched strip to one section before sticking it down to make a fancy edging to overlap the gift card. I've left it with no stamping or other images so there's plenty of space to write a personal message. I didn't have a gift card for the photograph so that's my National Trust membership card posing as a "body double"! If you watch the Hero Arts video, you might notice that my gift card is portrait orientation and theirs is landscape - either will work just fine as long as you cut the slit to the appropriate size, I just happen to like the proportions this way round. As well as this being a quick gift you could make, I have a quick gift for somebody today. 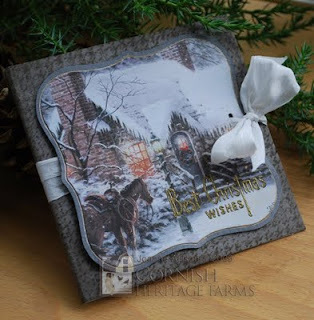 I have a pack each of Winter Wonderland and Victorian Christmas papers from the Thomas Kinkade line to give away. Each pack has four different Kinkade pictures on a full size (8" x 8") piece, four quad sheets (parts of the picture scaled down onto quarters of the sheet) and two sheets each of four different coordinating background designs for a total of 16 sheets in each pack. Just leave me a comment if you would like to go into the virtual hat - I'll close commenting at midnight Wednesday 30th September and pick out a name to receive the two packs. I'm happy to ship anywhere. 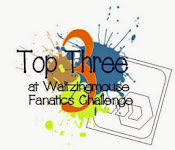 Thanks for stopping by on the continuing WCMD blog tour, I appreciate you taking the time! I love your gift card design. I have always admired the Kinkade papers but have never bought any of them. You have inspired me to try this. Absolutely beautiful! I am a kinkade junkie!! 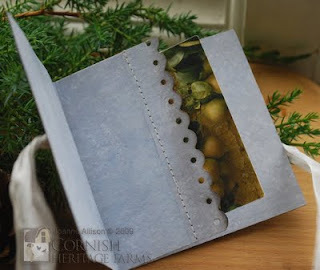 I am making Christmas cards this year with the Stonehearth Hutch stamp. PS I want the papers!!! This is gorgeous Joanne!! Thanks for the clever tip on using my Nesties on the Kinkade quads. I purchased that pack before last Christmas and just couldn't figure out the best way to use some of the pieces so as not to loose too much of the image! THIS is an awesome idea!! You're doing a wonderful job on the tour! Thanks for all the wonderful tips & tricks!! Great gift idea there Joanne, not long to go till the end of the 'card a day' blogging lol. I'm keeping my fingers crossed because I'd love those papers. Joanne what a fab idea - as soon as I saw it I wondered how you'd done the background - totally gorgeous papers....btw what do you mean by "warm" the paper? What a cool idea... fab card! That's super! Really elegant looking. Great way to use those papers - this is sooo pretty!! I've just cracked into mine, too - they're great for making quickie cards look awesome! Gorgeous card I LOVE it, thank you for this chance to win some goodies.